Our son Nikhil wanted me to buy a whistle – Fox 40 ‘Sport & Safety’ Classic Whistle- to be used for his life-guard training at the city’s swimming pool. I went to the store and was a bit surprised when I looked at the price-tag on the whistle – it costs $5. Thinking that I may not have zoomed on to the correct product, I looked carefully at the label to reconfirm it. Out of curiosity, on reaching home I “Googled” the product to see its characteristics and why a simple looking whistle cost me so much. As per the manufacturer, this whistle is easy to use, very loud that it can be heard over a mile away, is waterproof and unbreakable. Being made of plastic one does not have to worry about rust. It works even after it is wet because it does not have a ball in it. Aren’t such whistles required by our soldiers, especially those deployed on flood relief duties? During my service with the Indian Army, we have been called out to help the civil administration many a times. On many occasions we were placed on high-alert for flood-relief duties. There are many standard operating procedures (SOPs) in the units for flood-relief, but there is hardly any equipment available to execute the tasks. The army heavily relies on the ingenuity of the officers and soldiers to execute the task. Watermanship is an important aspect of military training. It comes handy while on war crossing water bodies, rivers and other obstacles. It becomes more important when dealing with natural disasters like Uttarakhand or Kashmir. There is hardly any attention paid to this aspect of training. Many of our soldiers are non-swimmers and hence training in personal safety while dealing with fast flowing currents, floatation devices, rescue equipment, etc become very important. There is hardly any rescue equipment worth its name authorised to any army unit, but they are always called out to deal with such situations. The biggest deficiency the army has is that there is no boats authorised to the army and our men are not trained in operating the outboard motors. Only some men from the Engineers are trained on it or those hailing from areas like the backwaters of Kerala have some experience. The army units are not even authorised life-jackets and the risk we are forcibly putting our men to without the life-jacket is well known to all. There is no High-visibility safety apparel (HVSA) -clothing (e.g. vests, bibs or coveralls) that is worn to improve how well other people “see” them (their visibility). In any developed country, it is mandatory for anyone operating in these circumstances to wear them. 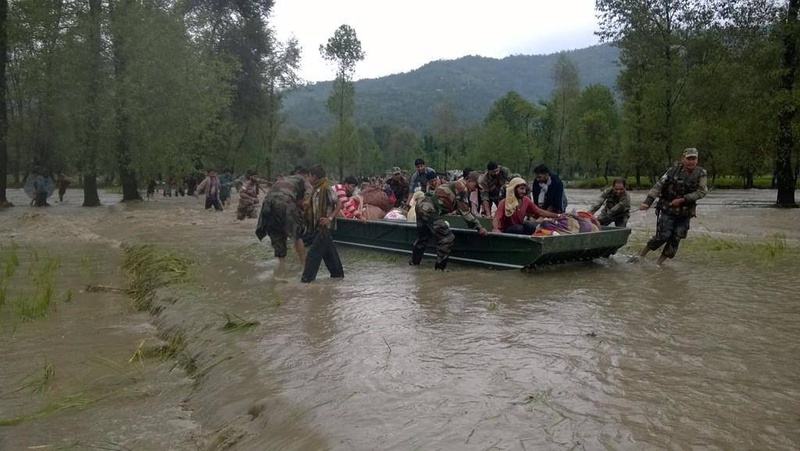 It is a pity to see our soldiers are without life-jackets and HVSA and all the personnel of the NDRF is fully geared. When will they equip all the soldiers of the Indian Army with these? Surely it does not cost much. Hence it is suggested that all the army units (especially the Infantry, Cavalry, Artillery, Engineers and Signals) be scaled with inflatable boats, outboard motors (with about 50% as spare as the local boats will be much effective with one), ropes, winching equipment, harnesses, rope bridges, etc. Further HVSA must be authorised as personal clothing for all ranks. This would be very useful for drivers, co-drivers and also passengers of military vehicles and also for anyone operating any plant or dozing equipment. This would also help while being deployed on aid to civil authorities for restoration of law and order. It would be a pity that a soldier’s life is to be martyred because of our short-sightedness. No battle should ever be lost and we should never lose a soldier for want of a horseshoe nail (life-jacket). Individual safety as well as some training for such tasks will go a long way towards improving efficiency.